The past few releases by art-rockers …And You Will Know Us by the Trail of Dead have each been generally described by one word, perhaps “loud” (2002’s Sources Tags & Codes) or “ambitious” (2006’s So Divided), but for all the sprawling endeavors the band has undertaken, The Century of Self might be the first best summed up as “long.” The disc itself runs a healthy 53 minutes, but its contents’ lengthiness has less to do with any kind of time imprint and more with how the increasingly complex song structures make those songs feel as though they go on forever, even when only three of the 13 tracks run over five minutes. As with most of AYWKUbtD’s attempts at expansive art-rock, this is mostly a good thing. Kicking off with the sweeping synth-and-drone crescendo of “Giants Causeway,” Century very quickly establishes itself in tone and ambition with the call-and-response rocking of “Far Pavilions” and frantic mini-epic “Isis Unveiled.” The arrangements will be recognizable to anyone familiar with the group’s previous efforts – heavily distorted guitars, top-flight drumming, willful shifts in tempo – but on Century, the group sounds vital and refreshed, as though they’ve come full circle from their major-label collage experiments. 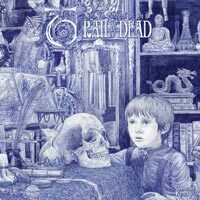 The tense, near-pop of “Pictures of an Only Child” and rousing sing-along of “Fields of Coal” show a newfound appreciation for hooks; where refrains have historically been this band’s accessories to a steady stream of interludes, Trail of Dead seem to have more openly embraced them as songwriting tools in and of themselves. If anything, the band has found a healthy balance between the Pink Floyd aspirations of its recent work and the Fugazi-covering-Sonic Youth nature of its early albums (as an interesting aside, the group also very closely resembles the former on the space-balladry of “Luna Park” and the latter on “Far Pavilions”). Still, the true success of Century lies not in any one track or in the relative taming of the group’s noise and prog tendencies, but more in the group’s sharpened focus and somewhat uncharacteristic restraint. To call The Century of Self a return to form would dismiss a lot of the group’s previous work, but more importantly would miss the entire point of their existence: form isn’t exactly something …And You Will Know Us by the Trail of Dead have ever really had, and the increasingly forward-thinking nature of their output suggests that maybe they never needed one, either.